Weather conditions can change in an instant. Warn motorists of poor driving conditions. Don’t leave safety to chance. 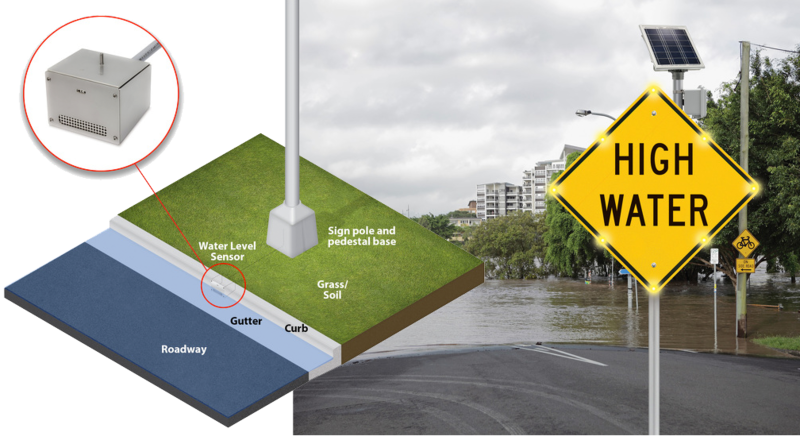 Send immediate notification with TAPCO solar-powered LED-enhanced BlinkerSign® Weather Warning Systems. Independent of the power grid, BlinkerSign® Weather Warning Systems can be triggered the second driving conditions become dangerous. BlinkerSign® solar powered signs provide drivers a real-time warning of icy roads ahead so they can slow down and take caution. Linked to the Surface Sentinel, the LEDs flash ONLY when road conditions are icy providing a dynamic, more effective warning than 24/7 flashing. The sensor is a compact and rugged sensor that provides surface temperature, air temperature, relative humidity and dew point from a fixed tower or pole. BlinkerSigns provide notification and awareness of closed roads, evacuation routes or dangerous driving conditions. The advanced warning allows drivers to turn around and take alternate routes preventing backups. Each MUTCD compliant BlinkerSign® is built to weather harsh conditions and emergency scenarios.